In God Gave Us Love, Lisa Bergren, author of the best-selling God Gave Us You books, explores another big question: Where does love come from? Perfect for children ages three through eight, the four-color picture book to a heartwarming approach to what God's love looks like, and how children can emulate His love in their relationships with friends and family. Little Cub and her Grampa are out fishing one blustery, arctic day when a batch of mischievous otters scare off the fish with their hijinks. Little Cub wonders why sometimes she doesn't like her critter friends even though she knows she should love them. Grampa gently explains to the young polar bear cub that love is a gift from God, tying us together. He also wisely shares that love between Mama and Papa Bears is different than loving otters or the tried-and-tested love Little Cub has for her rambunctious twin siblings. Little Cub, like many young ones just figuring out relationships and behaviors, has many questions for her Grampa, like is there any end to God's love for her and how does God show His love for her? He answers each with affirmation and tenderness. Before the family turns in for the night, Grampa tells Little Cub that God sent us his Son to show us the way to Him--offering us a God-sized love. The book features thirty-two full color illustrations, taking the familiar, adorable characters from the bestselling books God Gave Us You and God Gave Us Christmas, and enlisting them in a snapshot of family life and friendship, while having this important conversation. Set in the snow-covered arctic north, Little Cub is a young polar bear whose enthusiasm and curiosity mirrors that of every young child who wants to know more about her world. In God Gave Us Love, Little Cub learns from her Grampa the differences--and commonalities--between love Mamas and Papas share, familial love, love for friends--and how all that love reflects the love of God. BEST-SELLING SERIES: Previous books by this author featuring the same characters performed exceptionally well. Together God Gave Us You and God Gave Us Two have sold more than three-quarters of a million copies since 2000. God Gave Us Christmas has sold over 200,000 copies. BROAD, AFFIRMING APPEAL: This book will be especially popular with parents who want to help their 3-to-8 year-olds connect with the love of families and friends and an ever-present Heavenly father. Little ones are often trying to figure out where they "fit" in relationships and if they might do something to cause an adult, sibling, or peer to stop loving them. This book is a welcome affirmation and encouragement for children. POPULAR VERSE ANCHORS BOOK: Based on the well-known "love chapter" of Paul's letter to the Corinthians, God Gave Us Love is based around I Corinthians 13, specifically verses four through seven, where "Love is patient; Love is kind." ENDEARING CHARACTER: Little Cub has already captured the hearts of readers through her childlike curiosity and enthusiasm in the previous books. Children relate to her honest questioning and winsome nature. 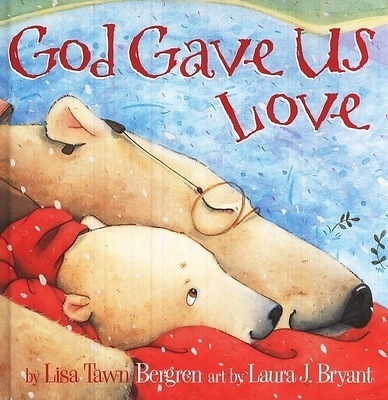 DELIGHTFUL ILLUSTRATIONS: Laura Bryant, illustrator for God Gave Us You, God Gave Us Two, and God Gave Us Heaven, crafts a detailed and delightful world of snow-covered wonders, adorable arctic creatures, and Little Cub's winsome polar bear family.